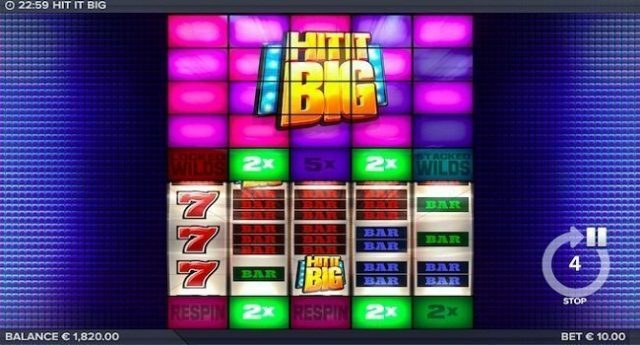 Welcome to ELK Studios new video slot game called Hit It Big. This Hit It Big online slot is a 5 reel, 3 rows and 5 Paylines retro slot machine that converts very well during. This game is playable across every single device including personal computer, tablets and mobile phones (Android, iOS or others) with coin sizes of 20p to up to100 per spin. The game contains traditional attributes as well as it is being updated with modern visuals features and special effects and hence the game offers grand prizes to players. With every single spin, you would not only make the reels in motion but you would also get a chance to load with additional reels feature that maximizes your winnings. This game is a classic 5 reel, 3 row slot game, where you will see a set of bright features listed above and below the reels that displays different features and for every single spin that bright feature will be changed. Land a matching features between upper and lower buttons and you would trigger the reel feature, where all your winnings will be multiplied to different times. The Hit It Big Bouns game is a 3 stage/level Bonus game. During this bonus game, you will have to progress from outer circle to middle circle avoiding the bandits and you would then get a chance to make 1000 times of your total stake. You can win 2x to up to 50 times of your stake during the bonus feature, but if the reels shows no feature the you wouldn’t get anything for the same. You will get a re-spin if this feature is triggered. Stacked Wilds- the full reel will be covered by the stacked wild and will form combinations. This feature will only come in to play when the feature is engaged. This slot is very good when it comes to playing online slot powered by ELK studios. You can win a maximum of 250,000 coins during your play.